Following up on a promise made after our meeting at FoB games at Historicon this past July, I drove down to Tarrytown for a game that Jared hosted, introducing five of his friends to Field of Battle, as modified by Tim Couper for World War 1, with some neat further tweaks for the Russian Civil War by Jared. 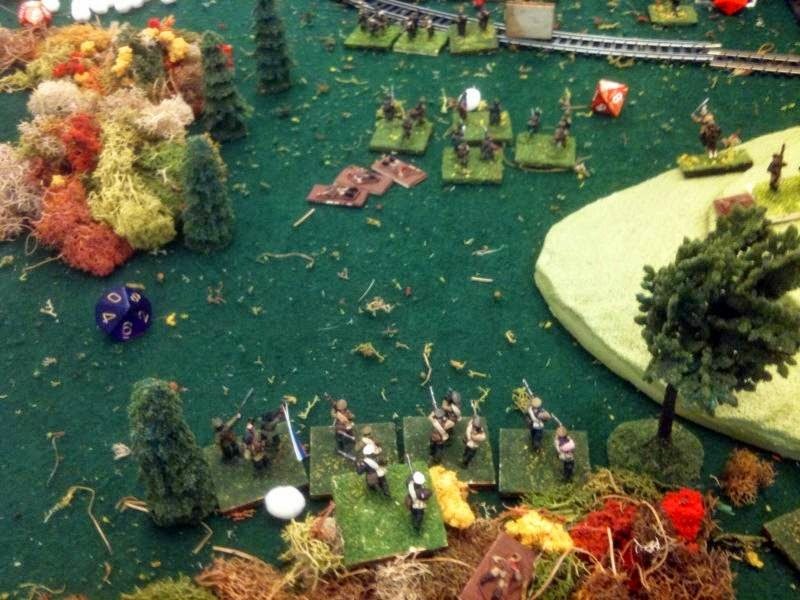 We used his 15mm figures, and had six players, three per side. 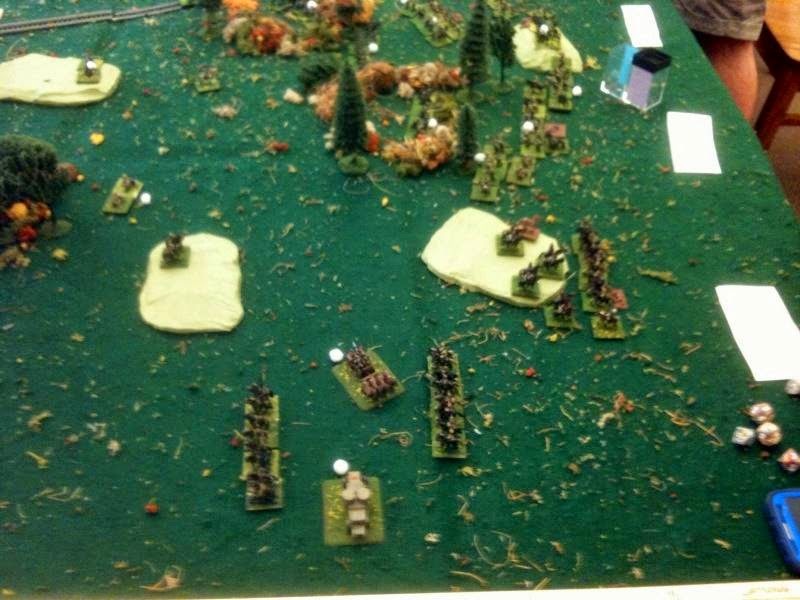 There were about 30 units a side, with 2-3 commands per player. 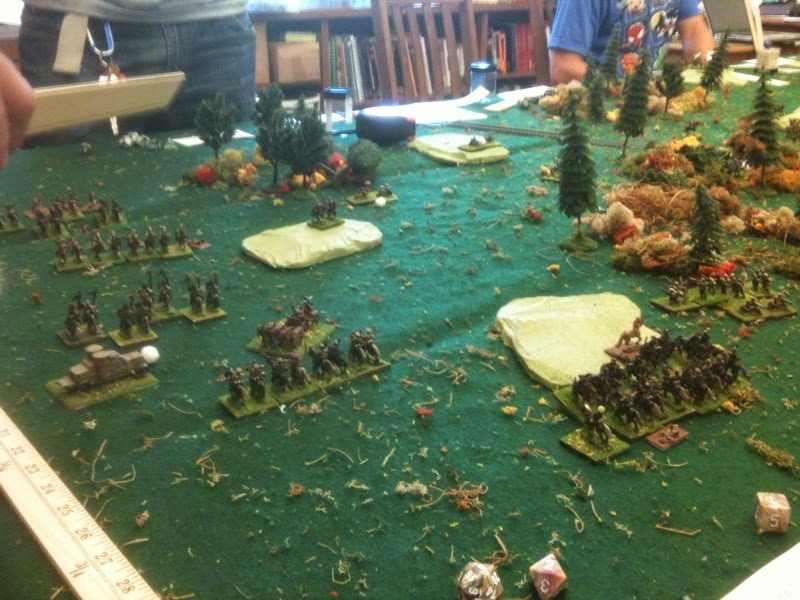 The Reds rolled up a substantial edge in AMP (Army Morale Points). "The battle was hypothetical, but based on historical circumstances. In the spring of 1919, Admiral Kolchak took his troops out of Siberia, along the Trans-Siberian Railroad, and marched West towards the city of Ufa, which he eventually took. 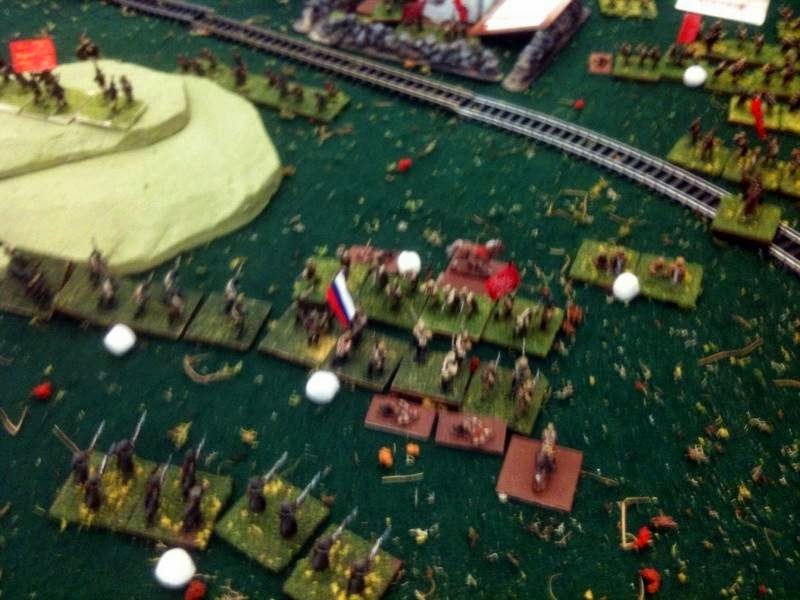 However, he outran his supplies, and by that point the Czechs were more or less done fighting. Most of the time they marched with him him, but guarded the rail line. Kolchak's army was so strung out that by the time the Reds were organized and trained, they were able to push him back. His army was broken and he himself was eventually executed." 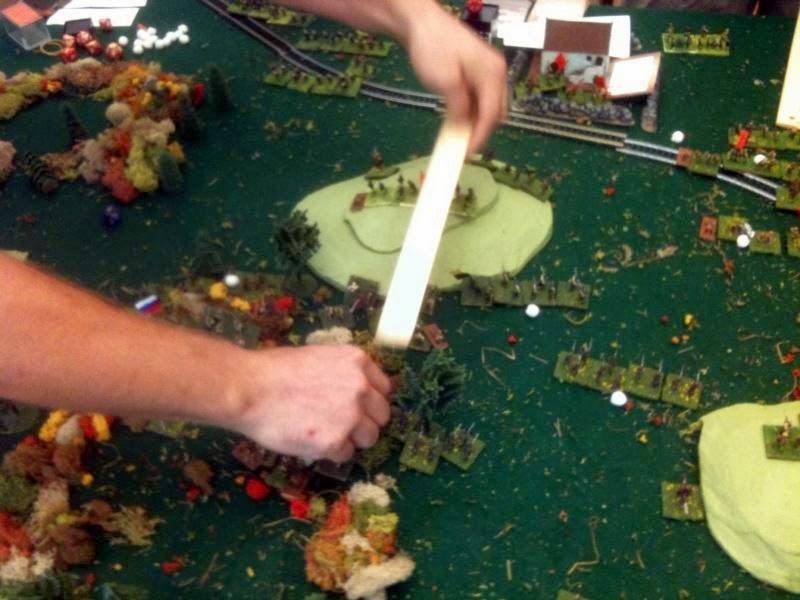 If I recall correctly, in the pre-game setup, the Whites were able to get one of their commands in an advanced position in a woods, while the Reds had a higher level of motivation and thus had a slightly better sequence deck and more AMP's. One of the Red commands had lagged behind, and thus was not optimally positioned. the onus was on the Whites to attack! Overview of the setup, looking from the South to the North (marked by Brian at the top of the picture). the white slips are the command listings, and will be relocated once play begins). 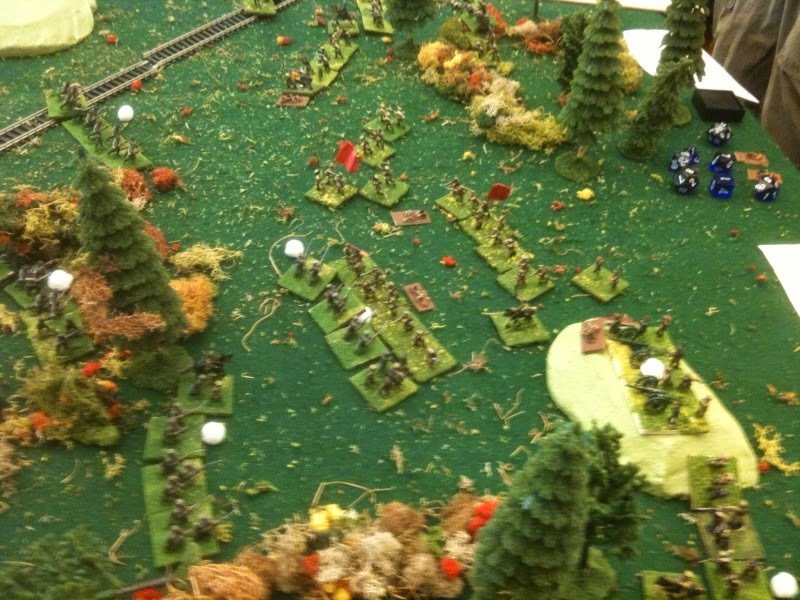 Left Flank of the Whites - Brian's fanatic Tsarists (#4, Martov) are in the woods with Battery on the hill to the far flank in support. while my good command (#3, Valieri is to their right. The (former) Tsar's guards have the yellow and Black (?Romnaov) flag. 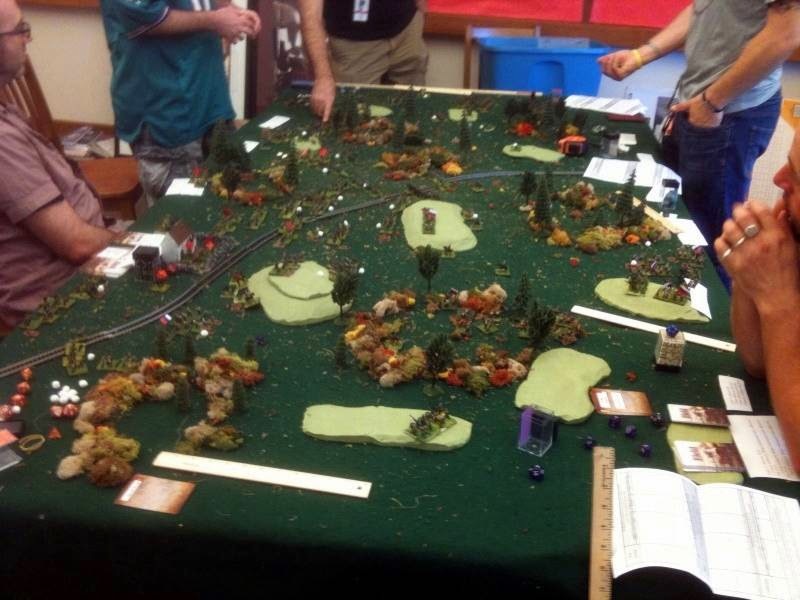 Close to the table edge is Brian's rabble command (#7, Arkus), which includes another artillery battery on a hill. 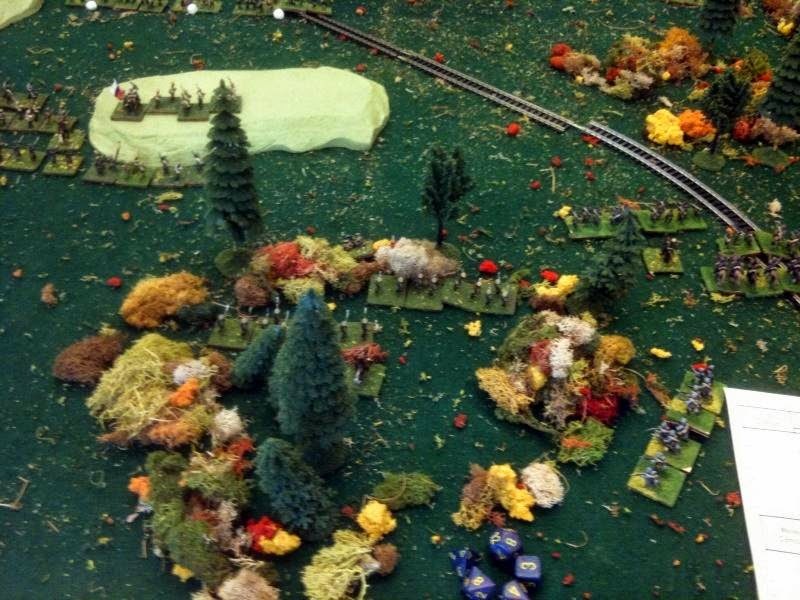 Not seen is a Reserve Howitzer battery under the C-in-C.
Center of the Whites: My rabble command (#6, Ilyriovich) is in the woods, including a barely seen Machine Gun company at the wood's edge. 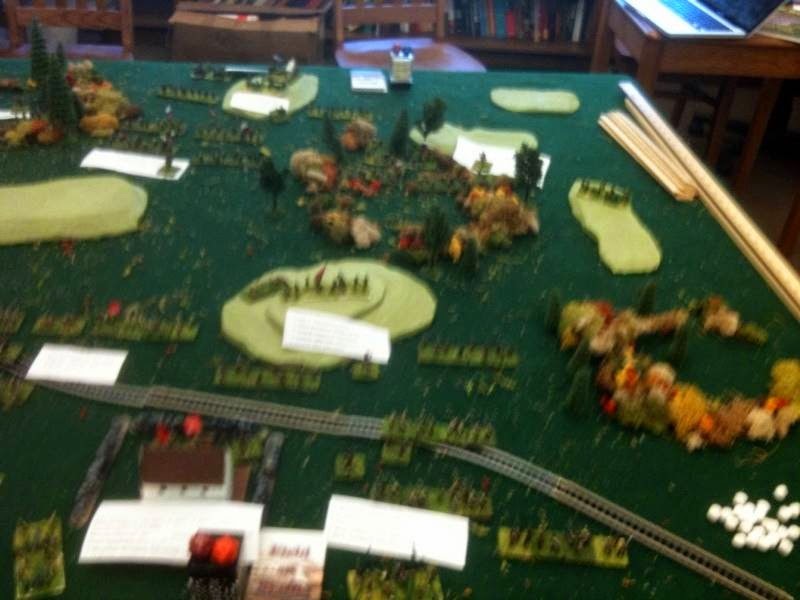 Blurry Pic from the Red Right flank - Raegan's Elite command (#1, Pavlovsky, including the Sailors, who would cover themselves with Glory on the day) is near the hill, while her supporting command, (#2, including an artillery battery, is at near the table edge still. I brought my Nikon digital camera to the game, but forgot to put the memory card in (duh! ), so we have to settle for these less than great pics from my i-phone. Red Center. Dan's commands include a brigade of Regulars (#3, Zemak, with MG) to the front, a brigade of conscripts (#4 Rukomov) to their rear, and another brigade of conscripts (#5, Ilyriovich-2, with attached Artillery battery). Close up of the Red Cavalry, Armored Car, and Tchanka,. Gotta love the cart - reminds me a bit of a Hussite War Wagon! 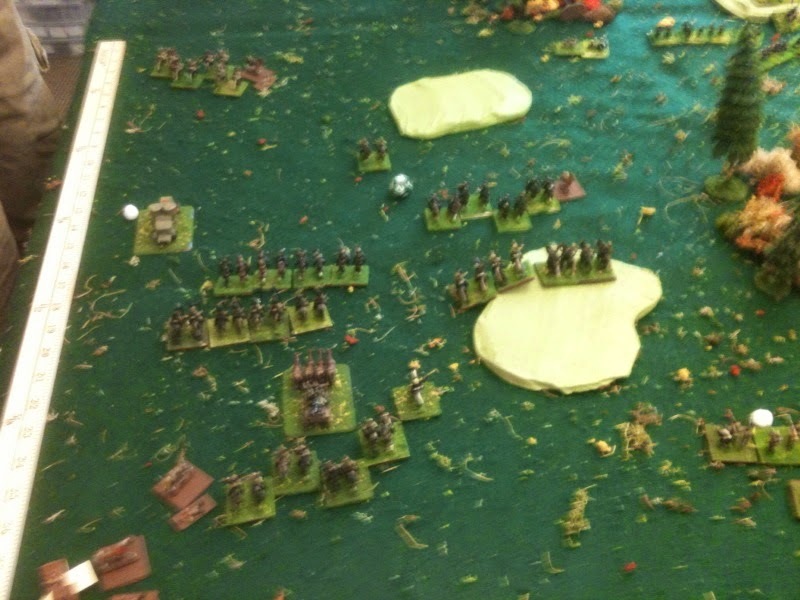 Opening moves on the White left flank. First blood to the Bolsheviks! On the White right flank, Gerard, evidently unimpressed with the mobile machine gun platforms of the enemy, throws his cavalry brigade forward in the attack! 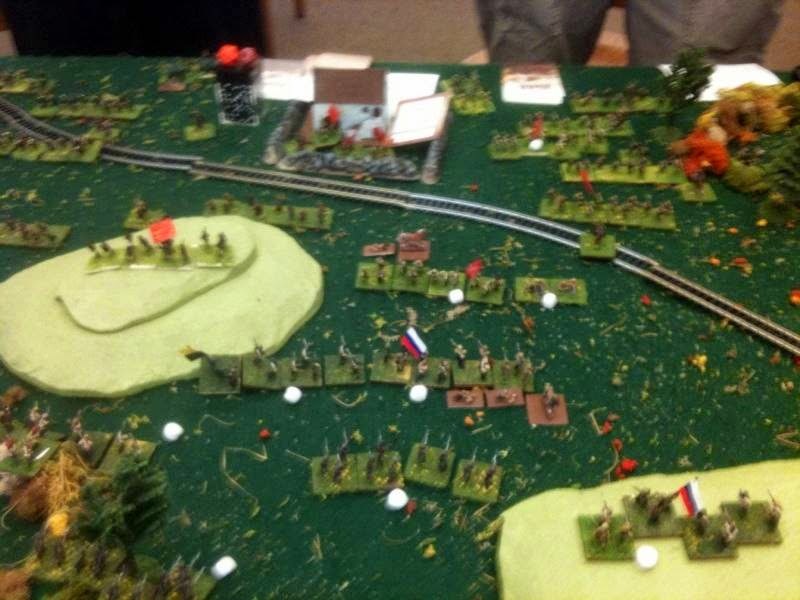 The Czech Legion also moves forward. They are not at all enthusiastic supporters of the White cause. Their objective is to get back to Prague with as few losses as possible! Meanwhile the commander of my Conscript brigade rolls a "1", and the conscripts decided that a nice cozy woods is a good place to be on a cool Siberian day! 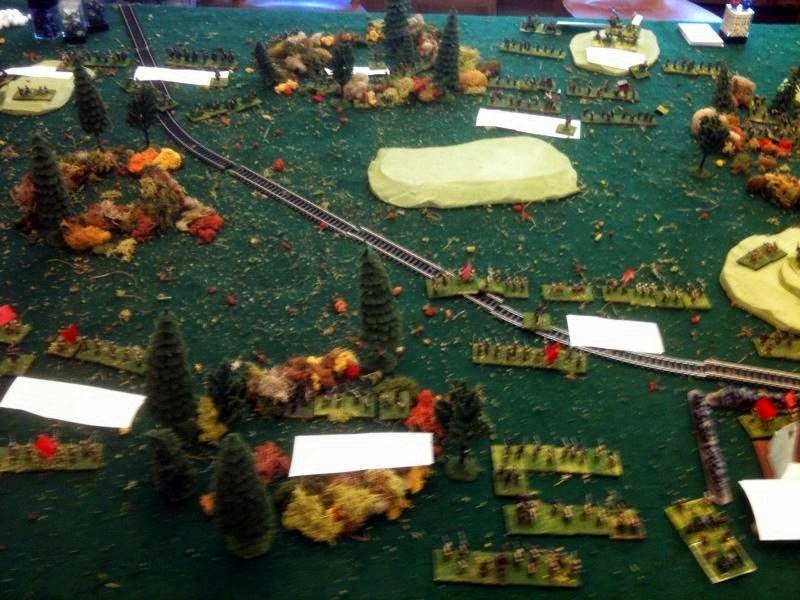 Another view of the White center - one of my units has crested the hill in the center of the battlefield. 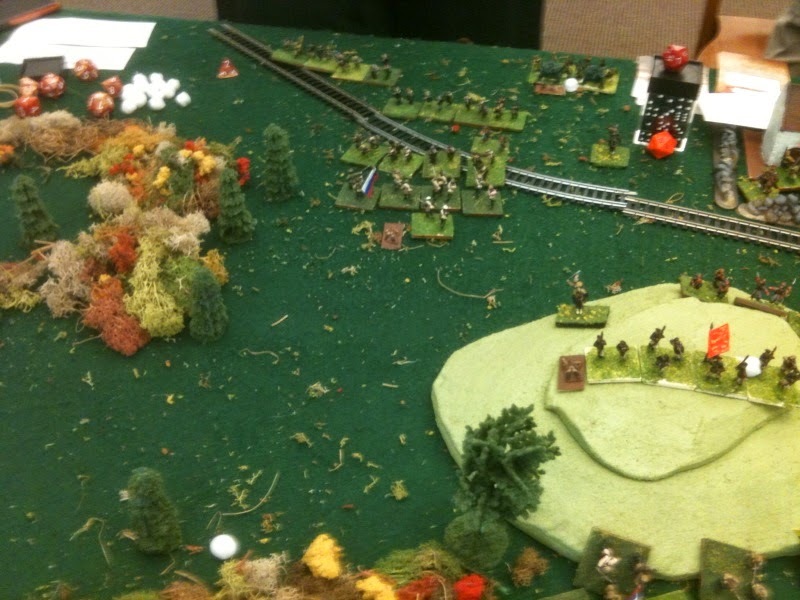 This is a Bad Thing as they immediately take rifle fire from THREE red infantry units as they crest the hill (note the three white "smoke balls" at the top of the picture). Result - 2 UI lost, and a ROUT result! As it turns out, these troops never will rally for the rest of the game. "We already did Godunov, Borris!" The machine guns of the armored car chatter... and fail to do discernible damage to the charging White cavalry! "What do you think we're fighting, Alexi - the Napoleonic wars, perhaps?" 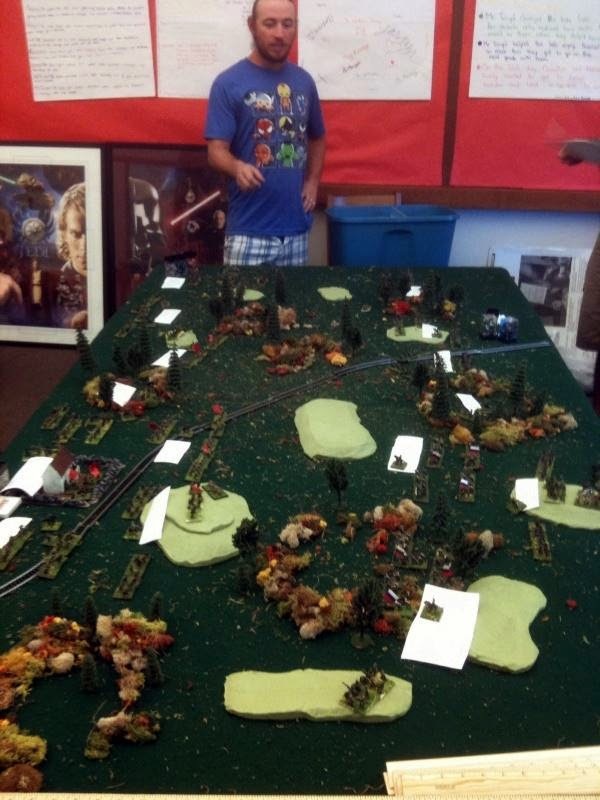 Each army wins one combat and routs the opposition in the process! and one of my Tsarists infantry is pummeled, losing 3 Unit Integrity! "Let us show you bourgeois bastards the Dictatorship of the Proletariat up close and personal!" 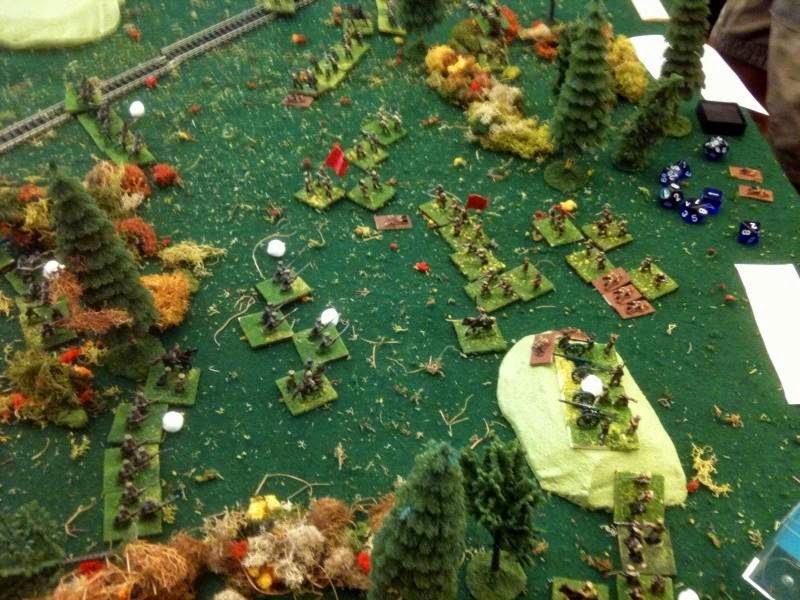 A battered unit of Red infantry charges an even more battered unit of Whites, as their supporting Machine gun jams. 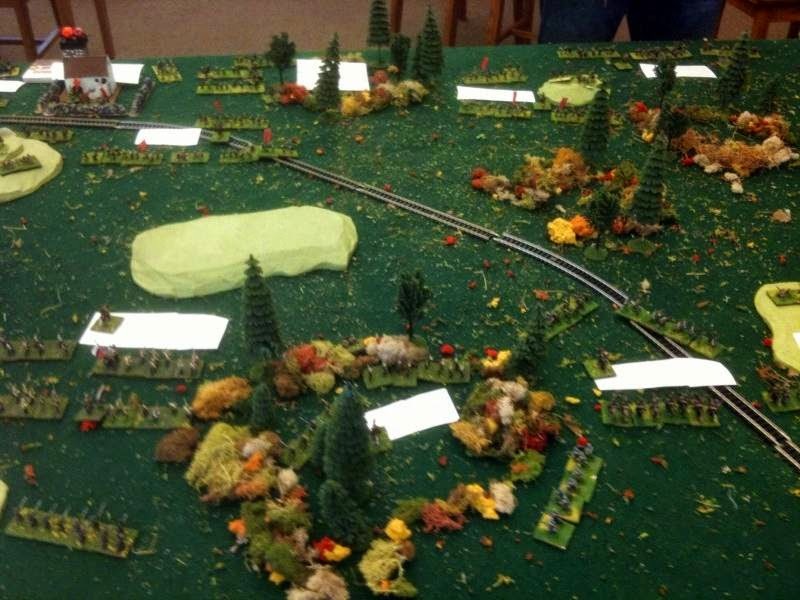 Gerard's Czech Legion continues its reluctant advance in the White right center. My Conscripts are enjoying roasting some quail in the woods, and decline to support them (Their Commander rolled another "1"!). 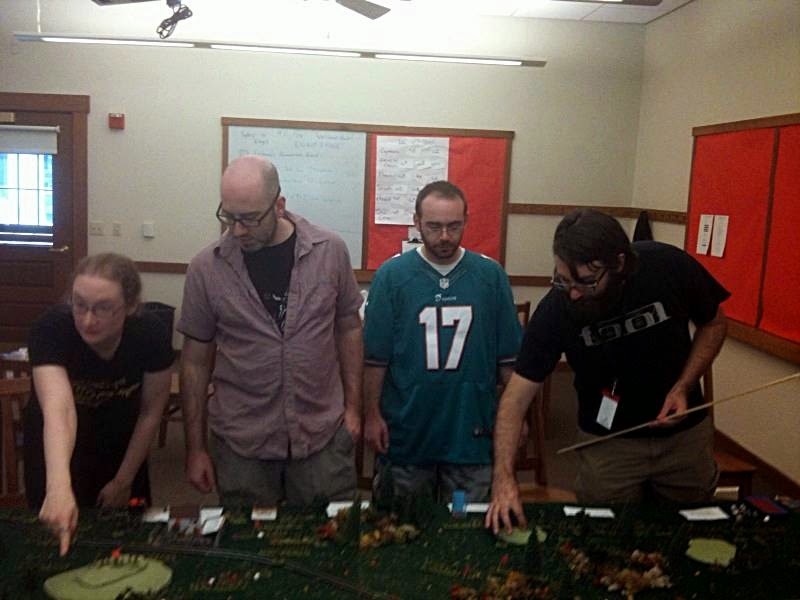 Left to right: Reagan, Dan, John, and GM Jared. and is soundly thrashed, so another climbs the hill to assault the sailors. It will also be repulsed with heavy losses! This prompts Brian to hurl a third unit at the Seamen. "Friend Brian Robertovich", I say, "perhaps zey should with their rifles shootski first?. Brian declines the unasked for advice. After all, it was Surovov himself who said "The bullet is a mad thing; only the bayonet knows what it is about!" The third unit is duly replused by the jubilant Sailors! 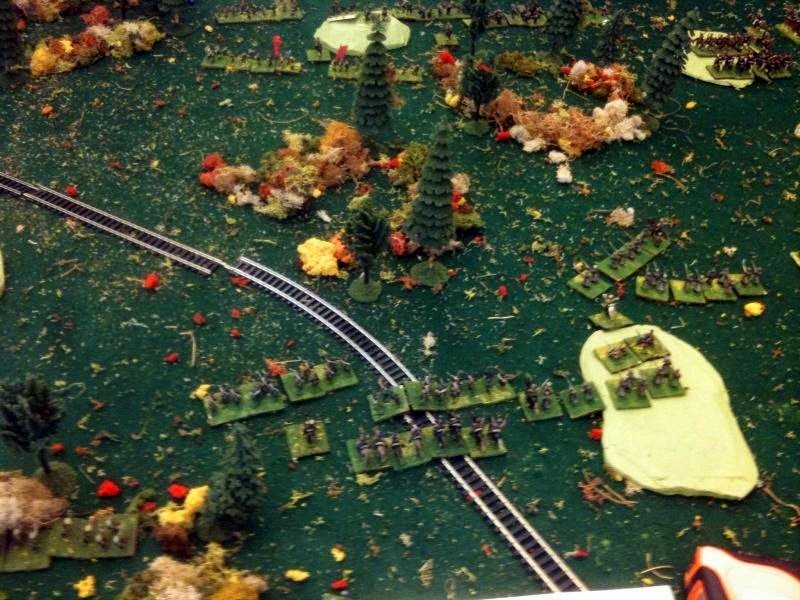 Cavalry action on the White Right/Red Left flank. 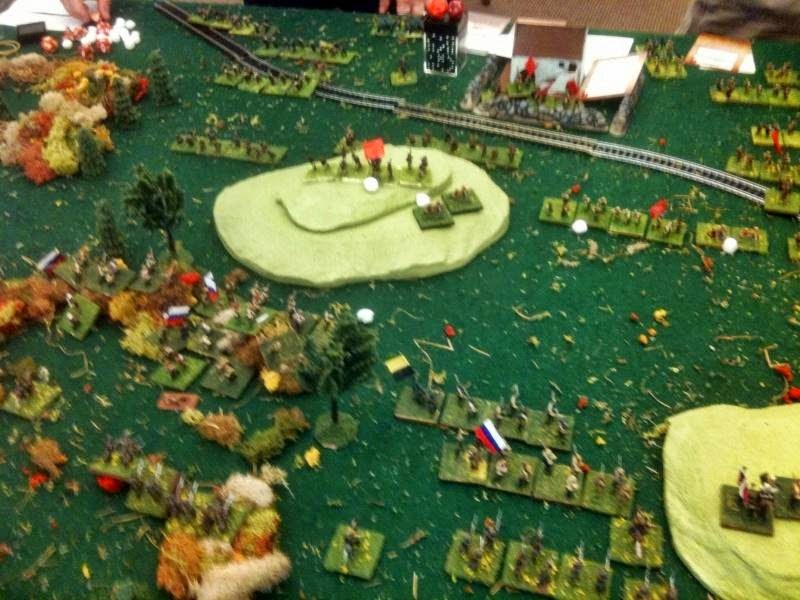 Czech Legion attacks in the Center, finally with a modicum of support from my Conscript brigade. It seems that all the game in the woods has been consumed, so now they need to find some Vodka with which to wash down their repast! Czechs are victorious. "Screw these Bolshevik bastards; all we want is to see Bohemia again before we die!" 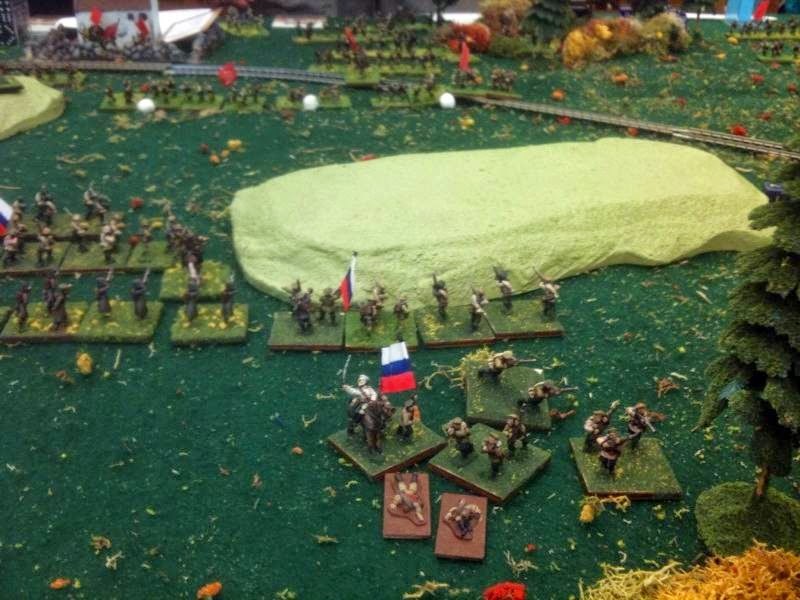 Meanwhile, the men of Brian's Tsarist brigade are seized with loathing for their social inferiors, and charge forth in a frenzy, not once but twice (the brigade is subject to Fanatic Action, and turns both Fanatic Action cards in the deck back to back). 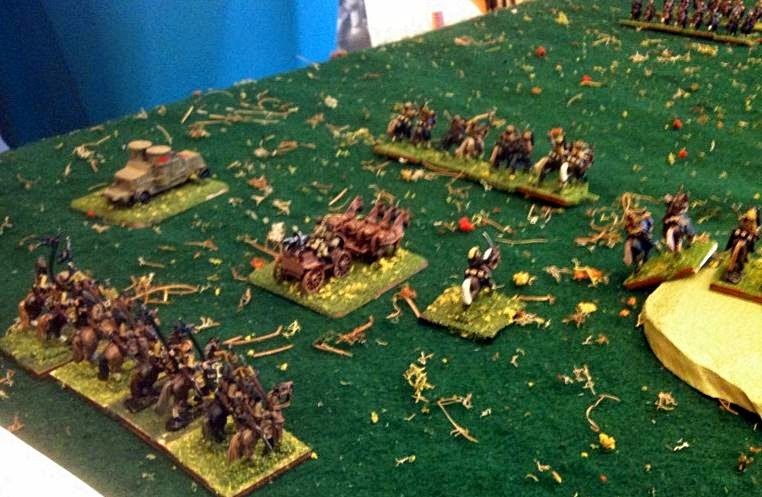 They sweep the Red infantry of their right flank before them. It seems that perhaps Surovov was right after all! 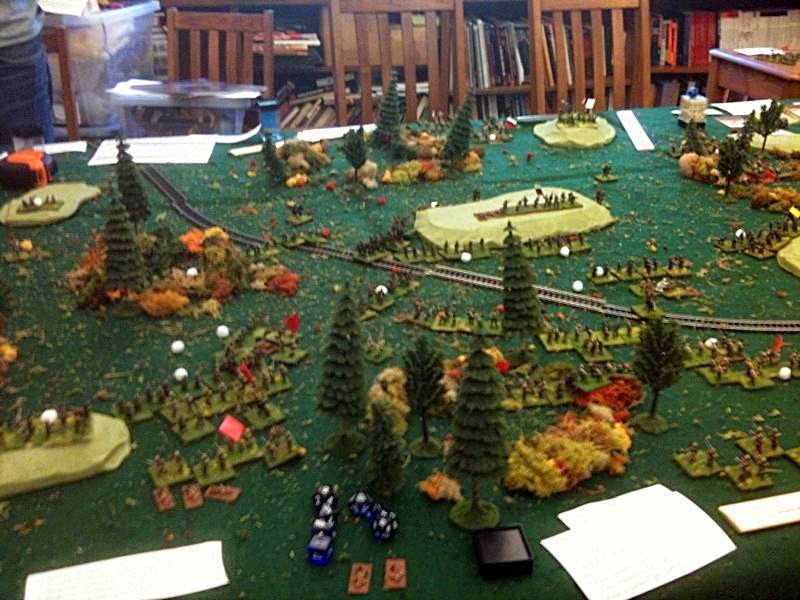 Overview of the Center of the battlefield from the Red side. 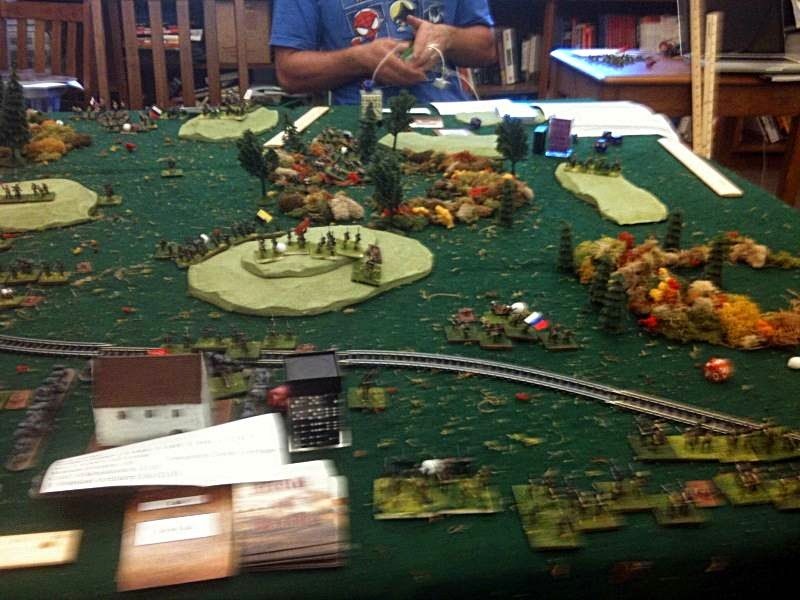 View from the Red right flank, looking at Brian and his commands. "Friend Brian Robertovich", I say. "perhaps we should combine the shots of your 2 artillery batteries and your howitzer battery upon those Seamen, so as to eject them from the hill?" "The moment has not yet come", he observes. The White cavalry is gradually gaining the upper hand. On the bright side for the Reds, their armored car has not yet broken down as they are wont to do (passed their Mechanical checks). 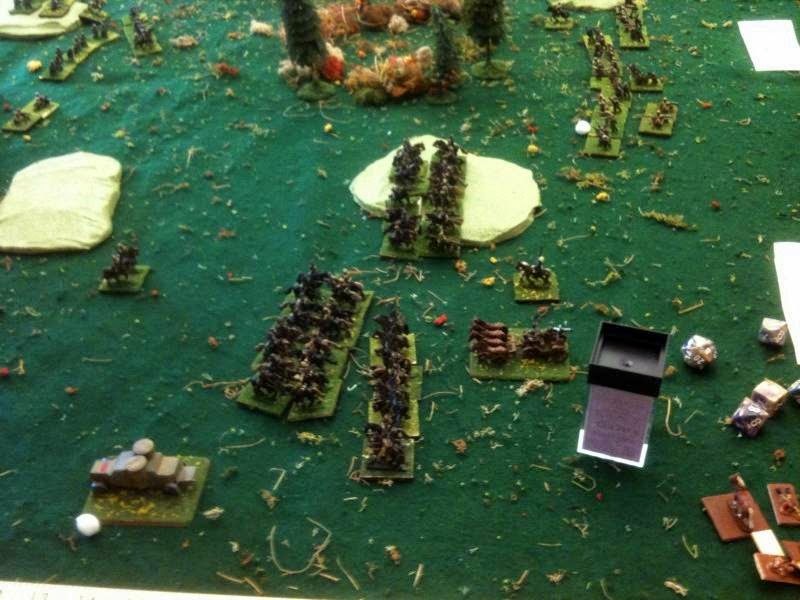 View from the White Center - note my conscript unit on the hill with three UI lost - units with a lowly D4 Defense Die type are always prime targets for enemy fire! 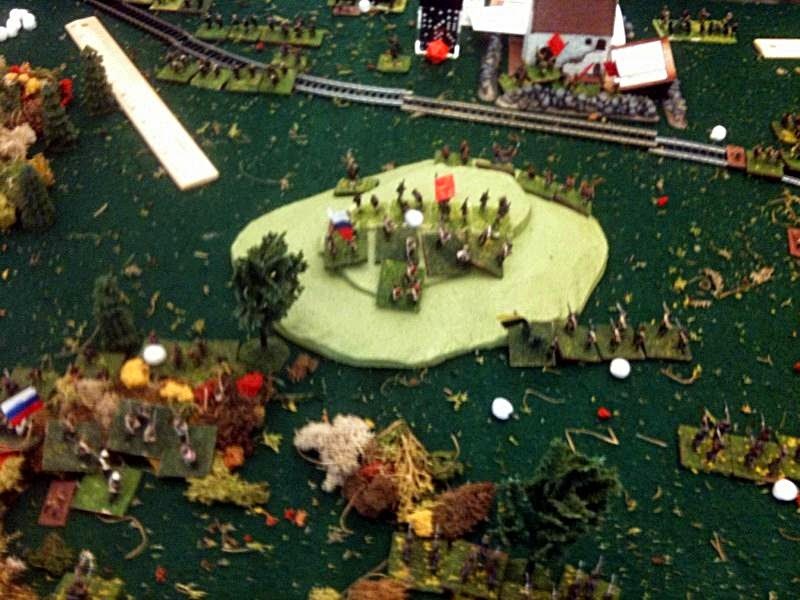 Overview of the final stage of the battle, looking North. Note the many white "smoke balls!" The Whites turn an Artillery Firepower card, and having started loaded already Brian can place up to six shots on the hill crest Seamen. Even though they did have a D10 Defense Die Type (! ), it was more than mortal flesh can stand, and they dribbled down the hillside towards safety. At this point, the Whites had 9 Morale points and The Reds have been at zero for quite some time. 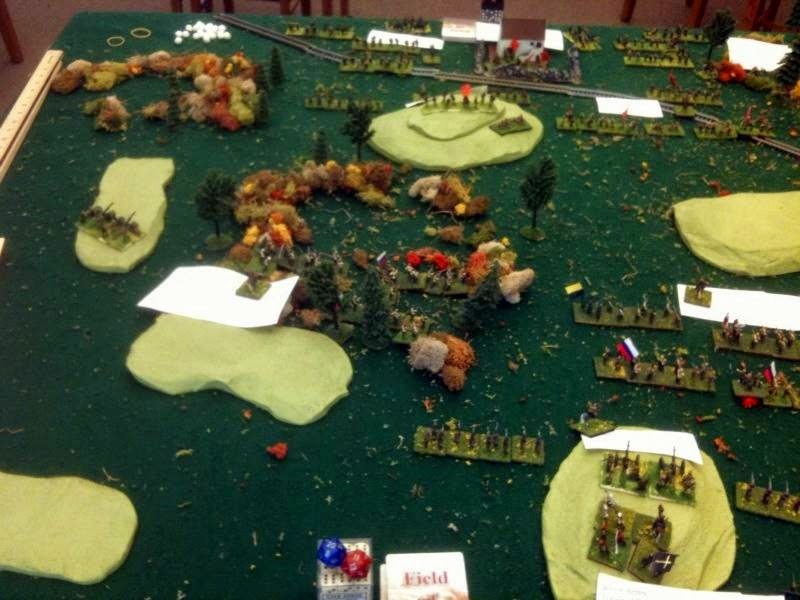 Their left flank is being turned by the Whites and the left center penetrated by the Czechs. The Reds concede and quit the field. A check of their sequence deck revealed that their top card was... Army Morale! The game took less than 4 hrs to play, including Jared explaining the rules to the other players, none of whom had played or even seen the rules previously. The venue for the game was Jared's Middle School classroom. The campus, neighborhood, and facilities are beautiful! 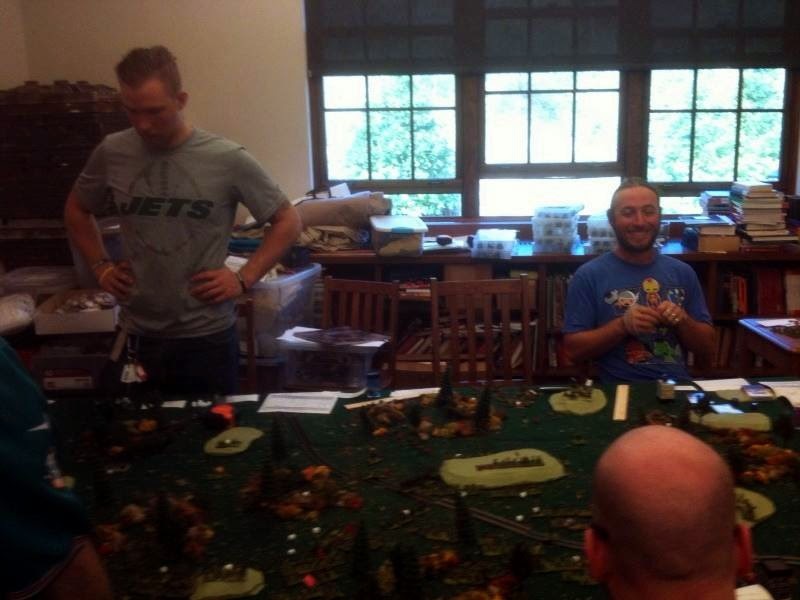 Jared teaches History there, and also sponsors the student gaming club at the school. It would make a great site for a mini convention, IMHO, being centrally located near the Tappan Zee Bridge, just off I-287. It is almost exactly an hour's drive away from my home, and a gorgeous drive it was, with the beginnings of the colors of Autumn suffusing the trees, and the mercury hitting 85 degrees in Danbury at 5 PM! I had a great time playing a handsome looking, fun game, and meeting new friends. I'll be back before long, and of course the lot of you are invited for a future game date at my home in Bridgewater, CT! 1 Hussar Regiment: 8 squadrons, 1,065 men. The Saxon Hussars were relatively late additions to the Army, raised in 1791. The original uniform was a white dolman with light blue collar and cuffs piped white, white pants, crimson and white "barrel sash", light blue pelisse with black fur and white lace and belts. The original headdress was a black mirliton with a light blue "wing", edged in white. The sabretache was light blue with white trim, and bore the crowned royal cipher in white and red. In 1806 the hussars adopted the shako with white plumes and cords and plumes, and the dolman became light blue. Traditional black Hungarian boots with white lace and tassels were worn. The shabraque was light blue edged in white from the inception of the unit. NCO's were noted to have white fur trim on their pelisses. The trumpeter's distinctions include a red dolman, light blue shako with a red plume, and white and light blue trumpet cords. Officers (seen alongside the trumpeter) substituted silver for white in all cords, lace, trim, etc, and had a black base to their plumes. *The Prinz Clemens regiment was converted to Uhlans in 1811; in 1813 their tunic changed to light blue with black facings piped in red. In 1815 the tunic changed again to red with light blue facings. Lance pennons white over green, but later red and white and red and green were reported. # This regiment had the shoulder straps and turnbacks piped in light buff. The Prinz Johann and von Polenz regiments were disbanded in 1813. Perhaps somewhat curiously, Red was the traditional color for the coats of the Saxon Light Cavalry/Dragoons. This certainly makes them stand out on the battlefields of Central Europe and Russia! GHat certainly makes them a treat to paint for us waragmers! This is the Prinz Johann Dragoons in their 1810 uniform, with their sharp looking black facings. I wasn't aware of the odd detail of the light buff piping to the shoulder straps and turnbacks when I painted them years ago. They carry yet another variety of the unique and attractive Saxon standards. The shabraque is red with a yellow edge, and a central stripe in the facing color. The Osprey and Nafziger says they were "in the facing color decorated with the electoral cipher". Other sources (see the post on the Saxon Line Infantry for listing) show something like the above, often with a wolves' tooth border of triangles in the facing color piped in white or yellow. I suspect from reviewing the many plates that the facing colored shabraques were associated with the pre 1810 uniforms, and the red ones with the later uniforms. Breeches were buff earlier, with white or light grey piped red as seen above noted later in the era. Prior to adopting the shako in 1810, a small bicorn was worn, decorated with a white or yellow lace edge, white cockade and plume. Unusually for German Cavalry, the trumpeter wears reversed colors - a black tunic faced in red, along with the red plume typical of German trumpeters of the era. The Osprey says the shako itself was red as well. I found no plates depicting that, however. As with the Infantry,. all the cavalry figures are vintage Minifigs. The Hussars were the first light cavalry of the Horse and Musket era in Europe, and as the originals, the Austrian (or more properly, Hungarian) Hussars set the model for all of the rest. The origin of the term is uncertain, but the most commonly accepted explanation is that was derived from a Hungarian word meaning "one in twenty", as selected for military service by lot. As such, non uniformed Hungarian Hussars dated back to at least the early Renaissance era. 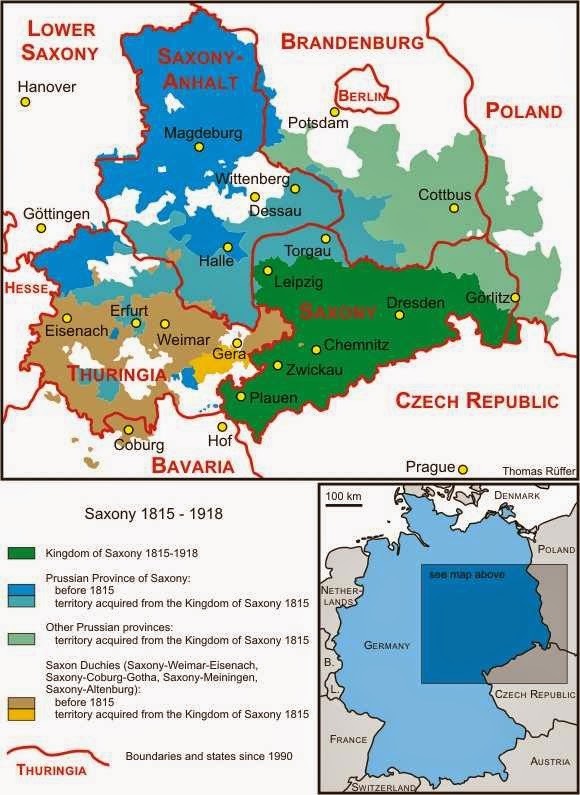 In the Holy Roman Empire (and later Austro-Hungarian Empire following the dissolution of the HRE in 1806), the Hussars were recruited exclusively from the "Hungarian" territories of the empire. Characteristic features of Hussar dress include the dolman, a tight fitting, extensively laced upper garment, and the pelisse, a heavily braided and fur lined jacket. The pelisse could be worn over the dolman, or slung over the shoulder jauntily. Unlike the Hussars of most other nations, the dolman and pelisse of the Austrian Hussars were invariably the same color. Hussar dress also included tight fitting pants, usually also decorated with lace/braid, and tasseled boots. The Hussars also had a unique accouterment, the sabretache, a sort of small pouch which hung suspended from the waist belt by three straps, the front side of which was often highly decorated, especially for officers. In the Austrian Hussars, the colors of the shako varied by the regiment, which really makes them stand out on the tabletop, and was different from the usual practice for most other nations. Finally, Hussar dress usually included a barrel sash around the waist. In the Austrian Hussars, all regiments used the same black mixed with yellow (reflecting the colors of the ruling Hapsburg dynasty) for the barrels sashes as they did for the braiding on the rest of their uniforms, while alternating bands of contrasting colors was the norm for other hussars. * like other Austrian regiments, the names of the hussar regiments were subject to change with changes of the Regiment's Inhaber. Knoetel gives Kornblumenblau (Cornflower Blue) for the dolman, pelisse and pants of regts # 6 and #12, and Ashgrau (Ash Grey) as the color of the shakos of the 3rd regiment. Funken gives the same in French equivalents. Pike grey has a very decided blue color to it which ash grey dies not. "Parrot Green" has now been shown to have been a rather ugly, light greenish yellow color. Evidently, units with light colored pelisses generally had black lambskin on them, while units with dark colored pelisses had brown lambskin, although the Osprey states that this was not invariable, and that white or fox fur linings were also used at times. HR #1, Kaiser Franz. This unit has rather conventional black shakos, unlike most of the other Austrian Hussar regiments. The sheepskin covered saddles worn over the shabraques were generally black for the Hussars, although white was not unknown. here I have given the Trumpeter white and the rest of the unit black. The valise carried at the back of the shabraque was red, generally without ornamentation. These Foundry figures were just finished this week. Dark Blue Dolman/Pelisse - Delta Ceramcoat Prussian Blue, slightly thinned 3:1. Brown fur on Pelisse: CC Brown Iron Oxide dry brushed with CC Bambi Brown. I used CC Straw Pale for the cords etc, which were of mixed black and yellow braided cord, but really at this distance would have appeared more of this kind of dull yellow color. This is HR #4, Hessen-Homburg. Their bright blue shakos make a striking contrast to the somber black of HR #1! Like most other cavalry of German nations, the trumpeter is distinguished by the red plume on his shako, and very little else. The trumpet cords are the same yellow mixed with black as used on the pelisse, dolman, breeeches, and shako. The white buttons contrasting with the black mixed with yellow braiding can be seen in this picture as well. I could perhaps have used an even more yellow shade for the "parrot green" of the dolman and pelisse for this unit, but I couldn't bring myself to make the shade quite that ugly! Top down view of HR #4. These two units of Foundry Hussars just added to my painted collection are a consequence of attending Historicon 2012. While there, Joe and I were perusing the flea market one day, and came upon old friend, Freddie Avner, who was trying to offload some surplus lead there. 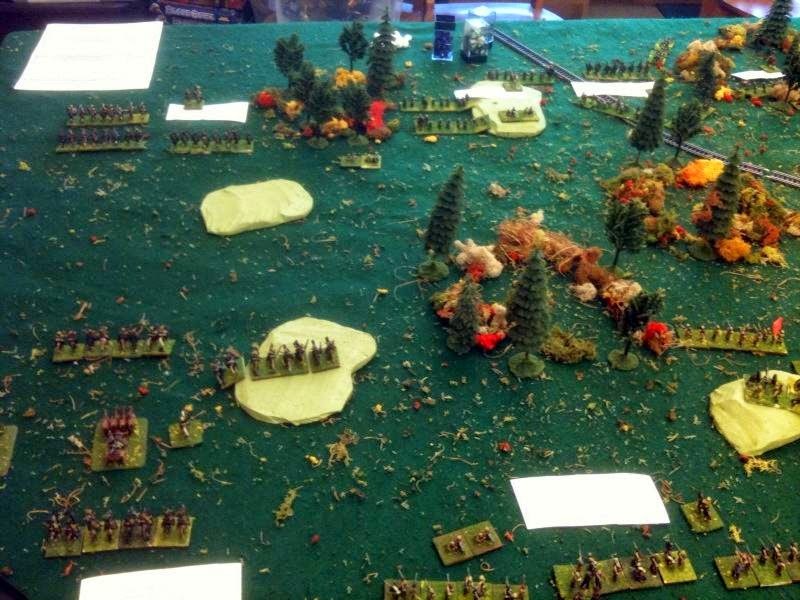 Among the items on the table were the castings for a 28 figure regiment of Foundry Austrian Hussars with command. 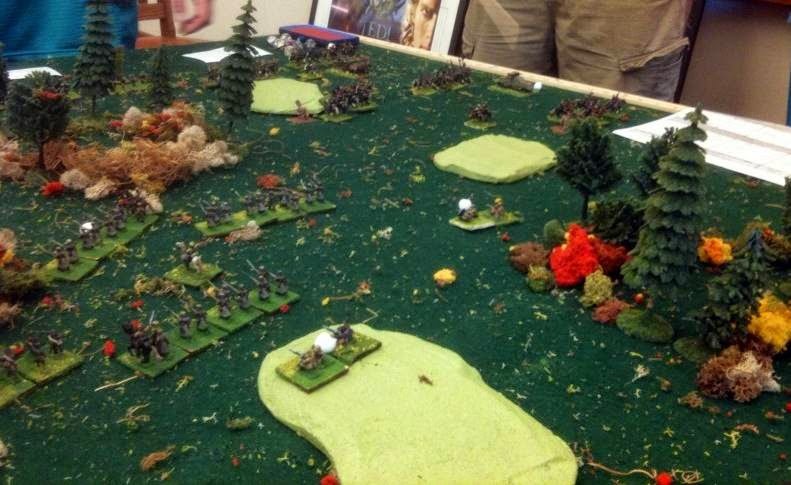 As seen here, the figures are very nice, but neither of us needed anywhere near that many hussars (we both field "regiments" of 8 figures, and there were not enough command figures as well). After a little calculating and finagling, we bough the whole lot from Freddie and split them between us, including the command figures, 14 each. If we each then purchased a pack of Foundry Austrian Hussar Command figures in the future, we'd each then have all the lead necessary for 2 new hussar regiments; the spare hussar figure could be used as an aide on a command stand. It took a while, but the results are now before you! The Regiment in line - the officer has gold cords in place of the black mixed with yellow, as well as an extra gold band on the upper part of the shako. I went with a simpler shabraque edging for this unit, just a broad yellow stripe with a central black line within it. These are Foundry figures once again. As the Austrian Hussars didn't carry standards, Foundry doesn't even make a Hussar standard bearer figure. This colorful unit is HR #7, Lichtenstein. the bright green shakos are quite striking, no? These are really vintage Minifigs, among the first of their "new" Napoleonic ranges. I remember painting them well - it was November, 1975, and I had finished painting them as a tension reliever while studying for midterm exams. I wanted to spray then with the usual varnish, and went out onto the fire escape in my dorm to do so. Unfortunately, it was a cool, very humid day, which resulted in my first experience of the dreaded varnish "frost", which really wrecked the paint jobs. I spot touched them up here and there before eventually deciding to completely repaint them several years later. Grrr! Now we know ways to reverse this dreaded occurrence, or even better, never spray on varnish on humid days!! On the simple but effective sculpting of the Minifigs, painting the cords yellow with black dots works OK to suggest the mixed yellow and black braid. Yes, I know I said the Hussars didn't carry standards, but if I were the Kaiser, mine would.... and so these do, too! I attempted a more elaborate shabraque edging here - white black-yellow-black-white, the black being drawn in with an India ink pen. . This rather more somber, over-sized regiment is HR #3, Erzherzog Ferdinand Carl d'Este. HR #3 wears essentially the same uniform as HR #1, except for the light grey shako. I have also painted this regiment with its dark blue breeches, While I painted HR #1 with the standard light grey cavalry breeches of the Austrian army, which were an option for field wear by the Hussars. These Minifigs once again carry a standard per my personal preference for same. The Sabretache was red with a yellow and black border. It bore the crowned Imperial Cipher, "F2 until 1806, then F1 when Holy Roman Emperor Francis II became Austrian Emperor Francis I. Here is HR #5, Baron Ott, with their striking scarlet shakos. 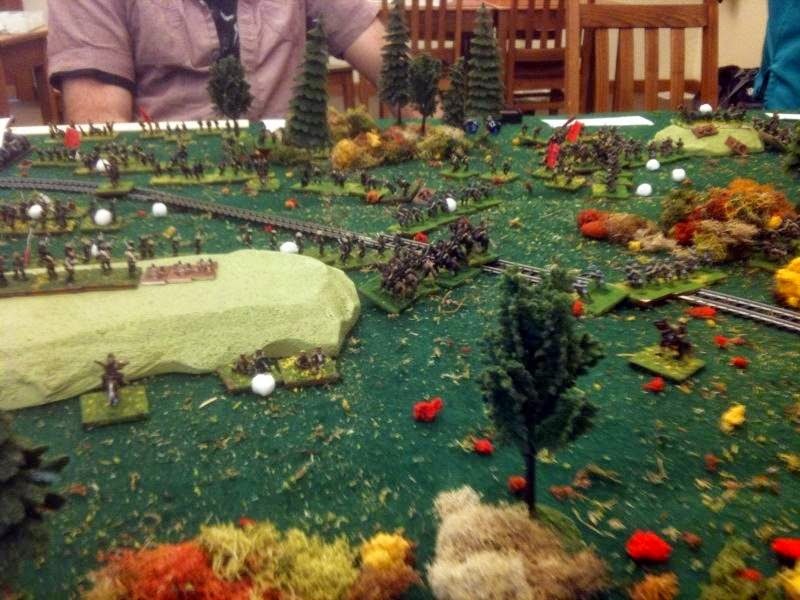 These rather large Essex figures were painted about 7 years ago. Like most of the rest of the Austrian army in 1809, they sport the "field sign" of a cluster of oak leaves on their shakos. Most of this unit wears their pelisses over their dolmans. The dark red pants are another colorful element of this regiment's costume! Written a little after our time (1875), but the rousing "Hungarian Attack March" by Franz Liszt is worth a listen for mood music!